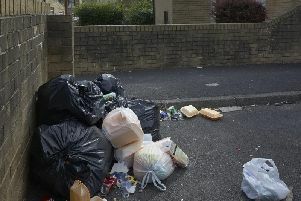 Gritting issues are still causing problems for residents, three weeks after the cold spell began to bite amid a re-organisation of Calderdale Council’s gritting policy. Problems with the service are still being reported, with instances of primary routes not being salted and roads gritted on one side but not the other causing issues. Resident Mr Christopher Copley said the situation at the Pavement Lane junction with Keighley Road was chaotic, with just one side of Pavement Lane gritted. Resultant traffic manoevres included buses spinning and sliding in the snow and a near head-on collision. At the December 7 Place Scrutiny Board, Conservative councillors, including Coun Andrew Tagg (Skircoat) suggested the new policy, which caused controversy as snow and ice began to bite at the end of November, be either dropped or rolled back. But the remaining majority of the panel felt it should continue, he said. Coun Tagg said events the morning after appeared to vindicate their concerns and he again questioned its implementation after a primary route - Shay Lane in Halifax - had not been gritted, resulting in a massive peak-time traffic jam in addition to schoolchildren’s safety issues. “It is inconceivable that this route which serves the largest school population in Calderdale was insufficiently gritted,” he said. However, Calderdale Council’s head of highways Steven Lee said the council is gritting not only primary but secondary and tertiary routes as well. “Shay Lane had been salted as a primary road, but unfortunately heavy rain caused the initial salting to be washed away. Further cycles of gritting took place, but as a full grit of the primary network takes three hours, there will have been a short interval between gritting,” he said. “On most of the roads in Calderdale, a gritter can cover both sides of the road at once. However, on some particularly wide roads, such as Keighley Road, they can only grit one side at a time so gritters are required to travel on both sides. “Depending on the location there can be a gap in between these grits as vehicles take the most efficient route available. “Our gritting pilot policy, based on a much fairer assessment of gritting priorities, continues to roll out. The Council is currently installing an additional 200 salt bins around the borough. “Over 600 salt bins have also been checked and replaced where necessary across Calderdale so that residents can help keep neighbourhood streets and paths clear of ice and snow. “Routes served by grit bins will also receive visits from grit vehicles when weather conditions are particularly severe and persistent. Further work continues on assessment of roads as the pilot gritting policy continues through the winter. “This week has also seen us start gritting footpaths in town centres for the first time.